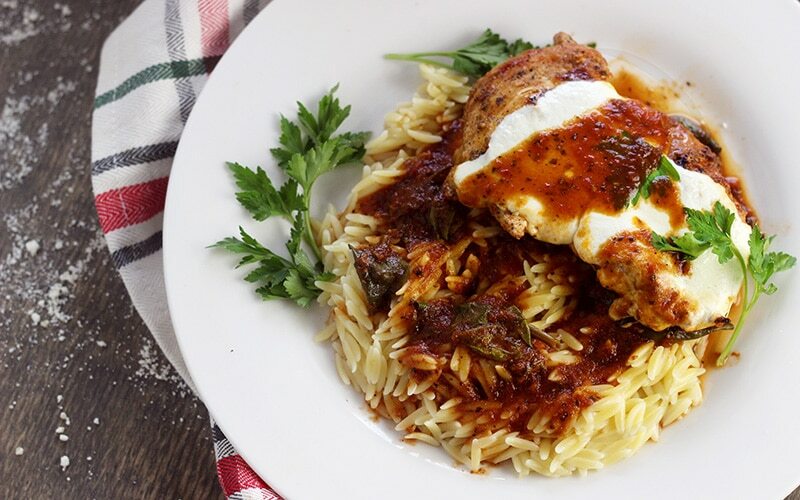 A delicious combination of tangy, sweet sauce with chicken and spinach served atop delicious Orzo in this skillet meal. 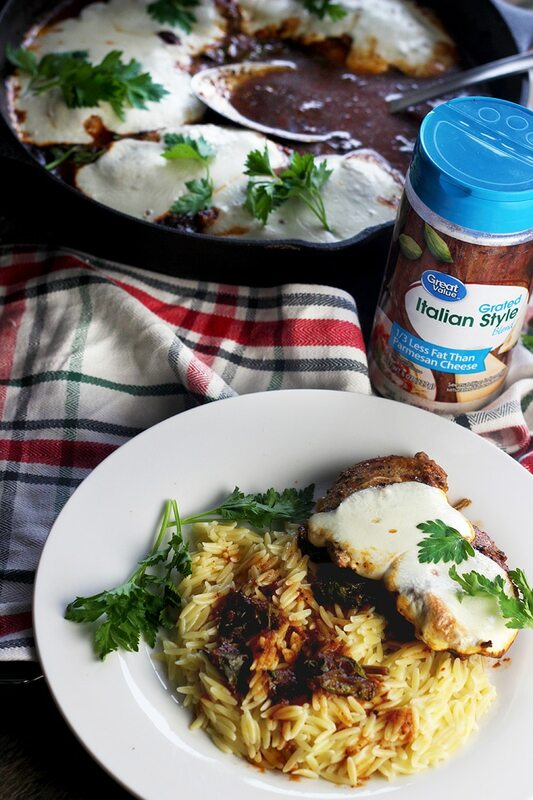 When is the last time you made a skillet meal to save on time and serve up all the yum? If you have never used your cast iron skillet to make a one pot meal you are cheating yourself in the kitchen. But let me help you! I'd like to think of myself of the thirty minute meal queen, in addition to a few other things. I cook delicious meals but I am just not spending a whole lot of time in the kitchen doing it. Sunday's are typically when I put in the most effort. But on a recent Sunday, I made a meal that tasted like I put in a whole lot of time, and I didn’t! That is a Win! I had a meat and vegetable in one space. Started on the stove and ended in the oven, without ever changing dishes. That my friends, is what I call magic. I made a delicious meal that was nothing short of amazing in under thirty minutes, and using one dish. I am. Thank you. Thank you! A delicious blend of juicy chicken breasts and spinach in a homemade tomato sauce and topped with cheese. Fresh mozzarella cheese. I chose to serve it over orzo pasta. But this could have easily been served over rice and been just as delicious. School is starting soon. Your schedule is gonna pick back up. Prepare yourself by having quick and easy, delicious meals that you can make with minimal effort and serve with love. 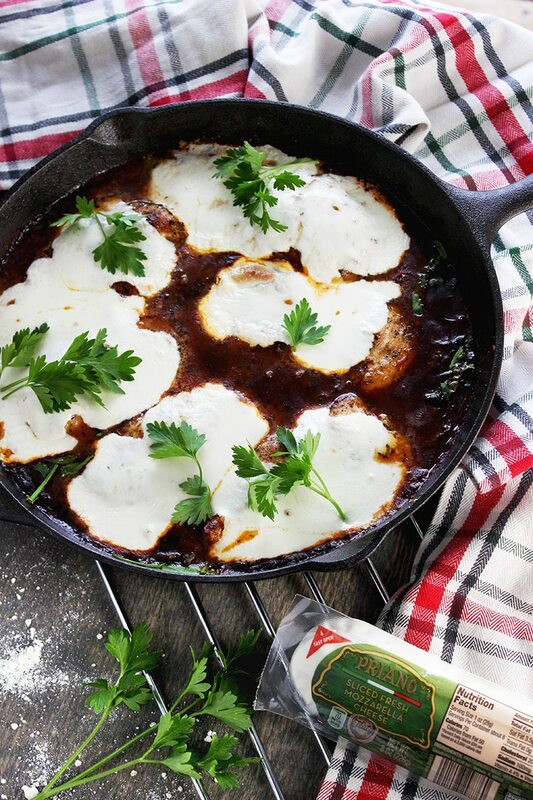 How do you make a skillet meal in your cast iron skillet? 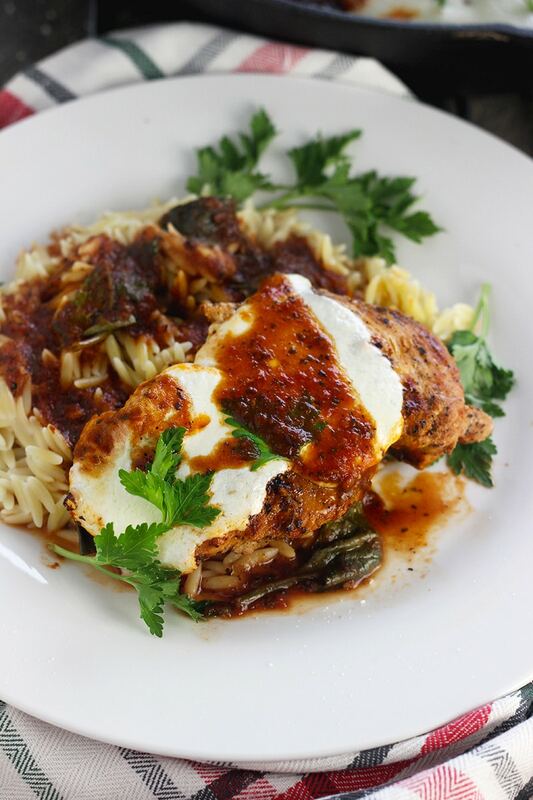 A delicious combination of tangy, sweet sauce with chicken and spinach served atop delicious Orzo. Bring medium pot of water to a boil. When water comes to a cook Orzo according to package instructions. Continue. Add can of tomatoes and tomato sauce in blender, ninja bullet, or similar. Sat aside. Add olive oil in cast iron skillet. Heat skillet. Add garlic. 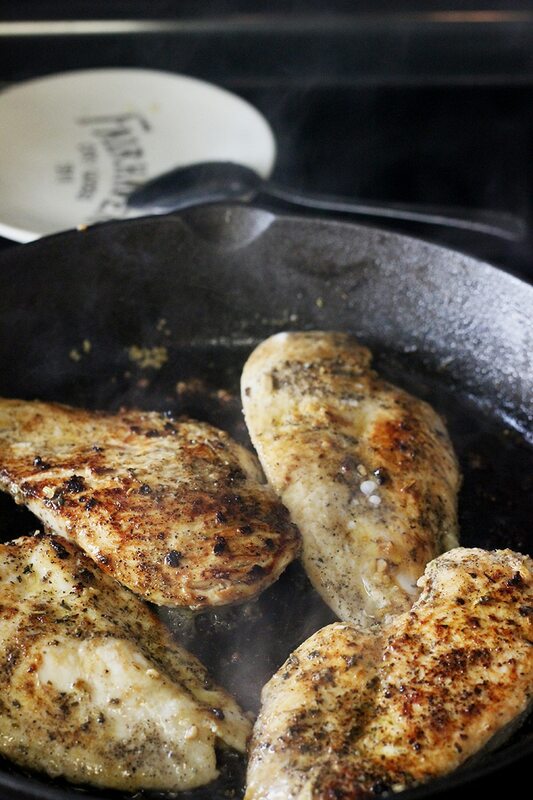 Once garlic has stated to sizzle add chicken to skillet. Brown on both sides cooking thoroughly. Once chicken is done, remove from skillet sat aside on plate. Add tomato mixture to skillet while still cooking, lower heat. Add oregano, basil, sugar. Let simmer 5 minutes. Turn oven on to broil, low. 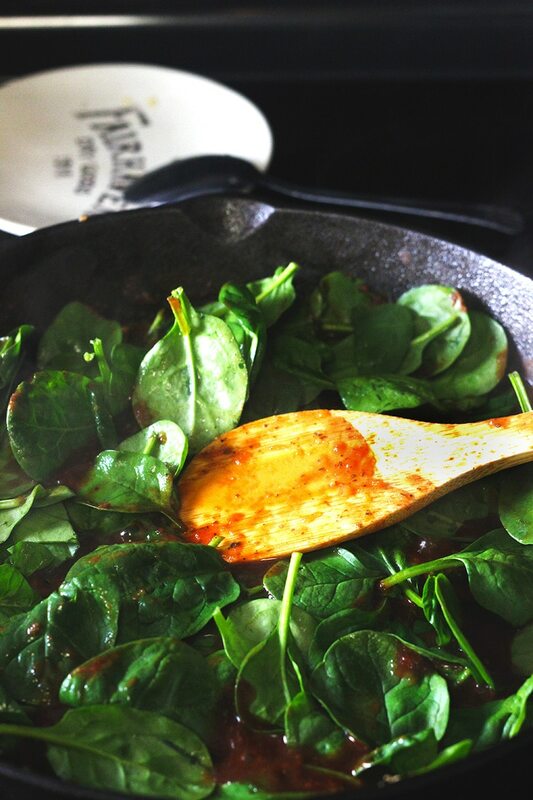 Add 3/4 cup of spinach on top of sauce and wait a minute to let it wilt. 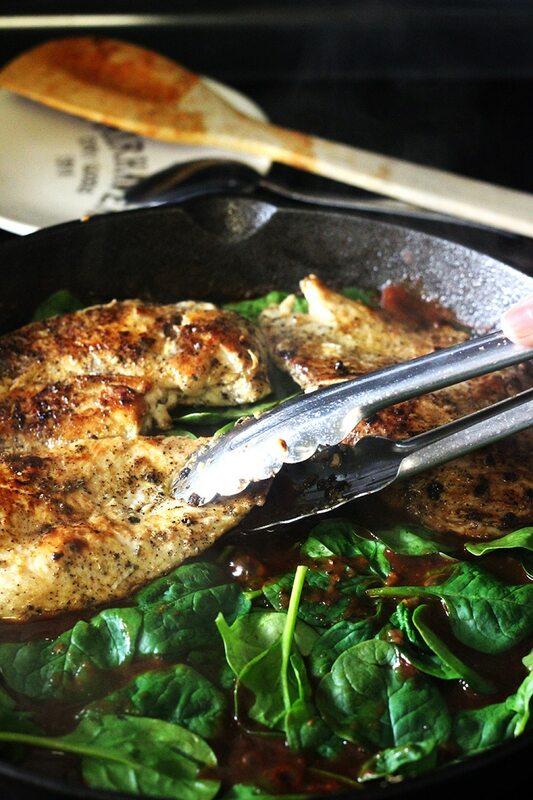 Place Chicken on top of spinach in skillet and top with remaining 3/4 cup of spinach. 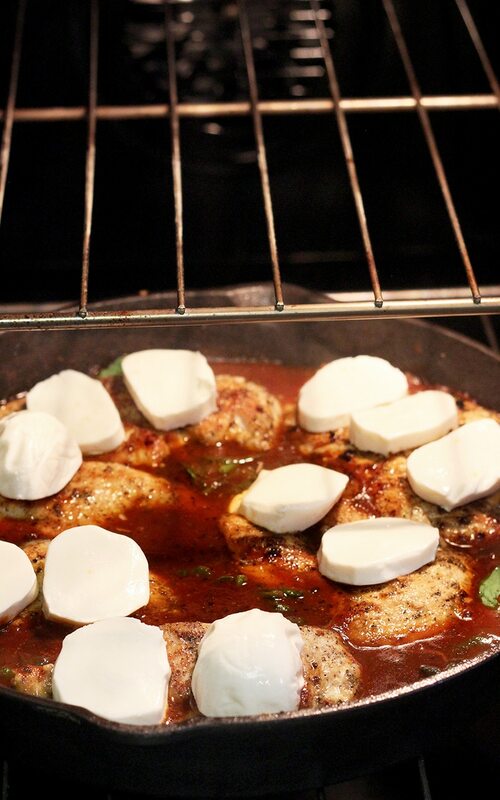 Top with mozzarella and remove from heat. Place in oven on middle rack and allow to broil until cheese starts to brown. Place pieces of chicken with spinach atop of spoonful of Orzo and use spoon to drizzle sauce on pasta. Add Parsley for garnishing or top with grated parmesan. Start by making your chicken. 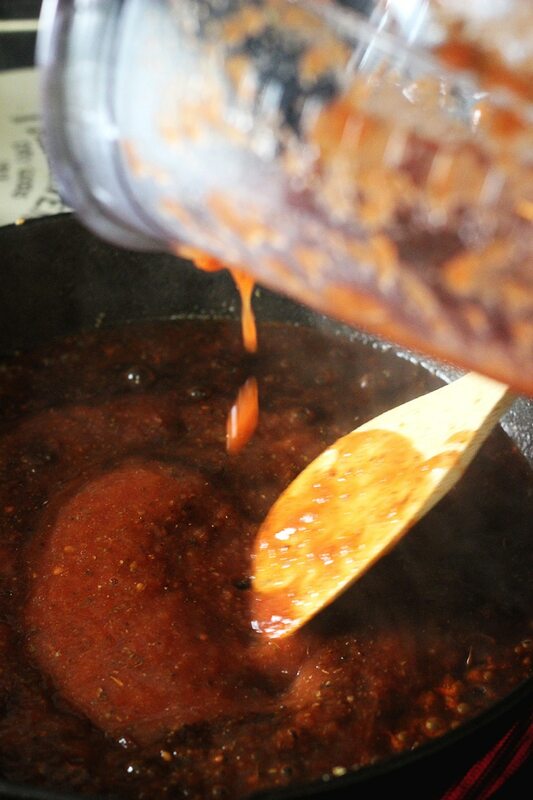 Setting it aside and then making your sauce. Replace the chicken in the skillet with spinach and cheese and you have made a meal that will leave you known as the champ. I don't know about you, but I love to be deemed the champ in the kitchen around these parts. You can join the club and thank me later. 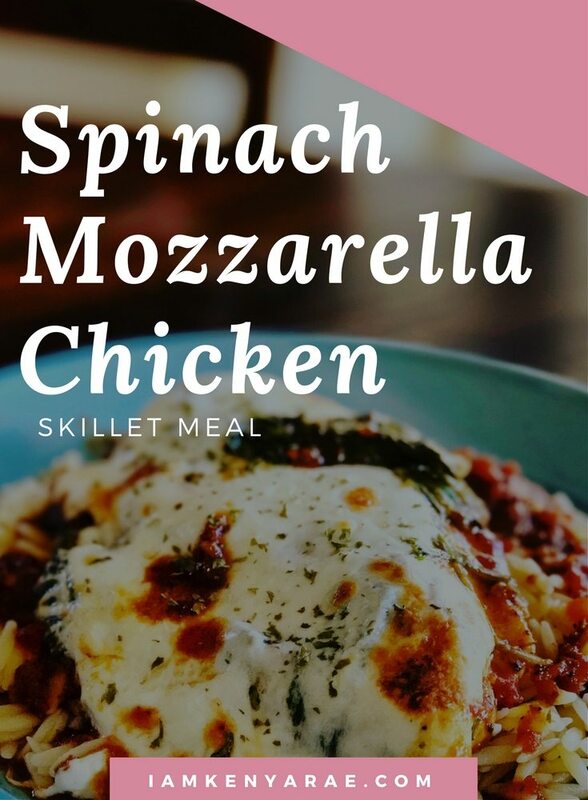 INTERESTED IN MAKING CHICKEN SPINACH MOZZARELLA SKILLET MEAL RECIPE? YOU CAN PIN IT AND SAVE IT FOR LATER WHEN YOU ARE READY TO MAKE IT! 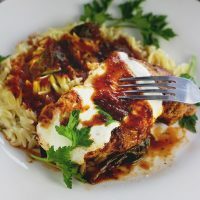 [wpurp-searchable-recipe]Spinach Mozzarella Chicken Skillet – A delicious combination of tangy, sweet sauce with chicken and spinach served atop delicious Orzo. Sounds Delicious!!! I love Orzo so this would’ve been perfect for me! LOL…solely based off the Orzo! I’m going to have to try this! Lol! I hope you like it Carissa! Its funny Im reading this article about orzo pasta because I had some for the first time at a co=workers house this week. This looks yummy and it looks easy to prepare. How did you like orzo? It’s like rice to me. But better. This looks delicious I’m going to add it our dinner menu for this week. Awesome! Lemme know how you like it! Simple enough for me! Just how I like it, quick and delicious. I’ve never made Orzo for my family because everyone is so picky. It’s hard being a foodie in a house full of picky eaters. Thank you for this awesome recipe..it definitely looks like you put in a lot of work. I actually don’t own a cast iron skillet but I’m planning on getting myself one soon.